Smeared and Smudged: More From Smeared Ink is the Smeared Ink sister blog dedicated to focusing on alternative art styling and unique ways to use rubber stamps. Whether you're an altered artist, cardmaker, scrapbooker, or other crafter that uses stamps in unique and interesting designs, you are welcome here! Yay! It has begun! Welcome to the fifth annual 31 Days of Halloween Blog Hop hosted by Smeared Ink and the Smeared and Smudged Forum. We are so excited to be bringing you one fantastic month long event! There is a whole lot of information to share with you, so please bear with me as I go over everything. First off, if you haven't experienced 31 Days of Halloween before, you are definitely in for a wild ride! Each year at the S&S Forum, we challenge our members to sign up to be what we call a Wicked Blogger. They will share with you one awe-inspiring Halloween or Day of the Dead themed project for the whole month of October, and each year we are thrilled with the variety and talent that is showcased by our Bloggers. The Wicked Bloggers will have their project posts up each day by 9am PST (Pacific Standard Time), and to reward them for their hard work and stress (believe me, it's stressful!) any Wicked Blogger who completes all 31 days of posts on time will be entered into our grand prize drawing at the end of the month. Here's a sneaky-peeky at the grand prize from Smeared Ink. Isn't it awesome? There is over $300 worth of amazing stuff in there. 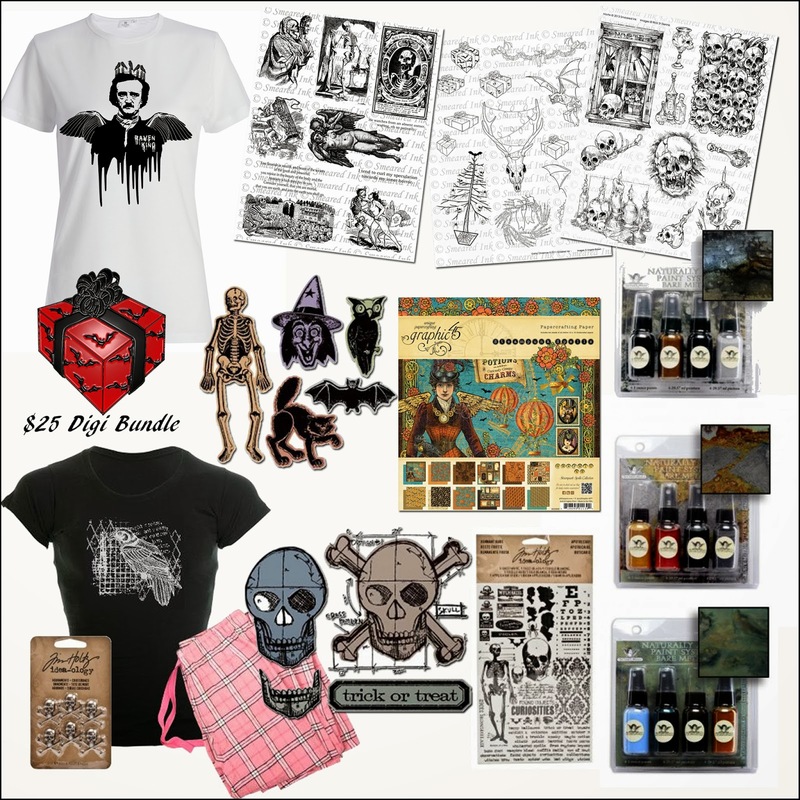 But guess what...even if you are not a Wicked Blogger, YOU still have the chance to be entered into our grand prize drawing!You can participate as a Horrifying Hopper this month and have a chance to win. Here's how it works: As a Horrifying Hopper you must hop through each and every blog on our blog roll and leave a comment on each project. Our Blog Roll is 36 people long, so it's definitely a challenge. If you leave a comment on every blog every day for the entire month, you will be entered into the drawing at the end of the month. It's a big commitment, just like the Bloggers, but well worth it since you get to view all of the outstanding artwork each day! Just like with the bloggers, all Horrifying Hopper comments must be posted by 9am PST. So if a post goes live at 9am, you have until 9am the following day to get your comment posted. And don't forget, the Wicked Bloggers have until 9am to get their posts up, so if you are an early hopper you may need to come back after 9am PST to see all the projects. I know some of you are saying to yourself "I can't possibly commit to that all month long". Well, don't fret, because we have even MORE ways for you to win some pretty impressive prizes! Each year we hold a scavenger hunt with prizes from some pretty amazing sponsors. 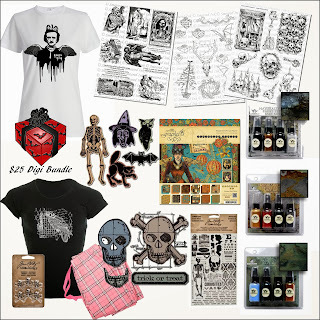 Our 31 Days visitors, or what we lovingly refer to as our Sinister Lurkers, our Horrifying Hoppers, and our Wicked Bloggers all have the chance to participate in the Scavenger Hunt. Each day one of our Wicked Bloggers will be hiding a tiny image on their blog. We will give you a clue about the image, and you get to find it. When you do, just EMAIL US it's location. Everyone who enters will be put in that day's drawing to win one of the sponsor prizes, and we will announce the winner the following day. Easy Peasy! All guesses must be received by 9am PST the following morning. So, there you have it, all of the rules and regs for 31 Days of Halloween. Be sure to refer back to them if you need to, enjoy the scavenger hunt and amazing sponsors, and above all, have fun!! Well..hopping around should keep me out of trouble for a while...(who am I trying to kid) looks like great hopping fun! At last ... the blog hop has started! *gg* Love it! and i'm looking forward to a lot of creepy, lovely, inspiring projects! whoohoo let the games begin! How do we leave comments on a Flickr account? Ionabunny, in my limited experience with Flicker, the latest post is the top left and to comment you click on that pic. That's not foolproof though - sometimes you get sent to the middle of someone's photosteam. I didn't see a 31 Days post there although she had some cool stuff. In addition to Brigitte, I saw three other blogs where I couldn't find a Day 1 post. Great stuff everywhere else!!! Holy CRAP, I love this type of Stuff! Wish I found this earlier it's already day 26! Where is your email subscription link Babe? Wanna hear all about the Smeared Ink stamp line, upcoming releases, specials and events? Wanna see some fabulous Smeared Ink inspiration? Join our monthly Anything Goes Challenge at Smudgy Antics, our Design Team Challenge Blog! Join other wicked awesome stampers on our Smeared and Smudged Facebook Group! Share your art, chat, and join others who love alternative, vintage, and gothic art rubber stamping! Stamps from all companies welcome. These talented ladies will rock it out each and every day on the Smudgy Antics Challenge Blog with their wicked Smeared Ink projects! Check out their wonderful blogs for some fabulous inspiration! Please respect my rights as an artist. Unless otherwise stated, all content including projects, text, videos, and photos on Smeared and Smudged are ©Terra Serrano. DO NOT copy my work for submission for publication, for contests, or to sell. You may, however, use my projects as inspiration for your own personal artistic growth. Thank You. If you see our images floating around the internet, please let us know! 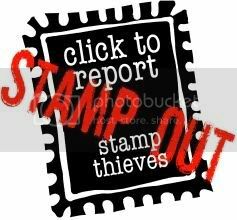 We are committed to taking the proper actions to help stamp out stamp thieves! All Projects and Content Copyright Terra Serrano. Simple theme. Powered by Blogger.